No Andy, but I'd love to. They were two great blokes, always up for the craic. old Trams going up the Oldpark Rd. Or even up arround Cliftonville Circus. we all had a great time talking about the old days. My mum grew up in torrens road with her brothers, harry, tommy, billy, eddie Crainey. The went to finniston primary. i have enjoyed looking through the forum and seeing the wonderful photos. Some photos for you, hope you enjoy viewing them. The first one is of Cliftonville Circus around 1900, I'm sure you will agree it's a lovely old photo. 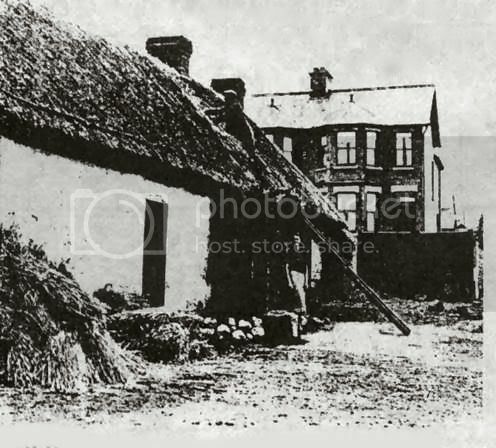 Next one, Thatched cottage Oldpark Village 1938. This photo was taken in 1969/70 at the bottom of the Oldpark Road, looks like some sort of protest going on, note the number of buses. Last one, The Park Cinema on the Oldpark Road. Seeing the photo of the park cinema brings back memories of when i was a child. We used to get 2 free tickets at primary school for the sat mornings. They used to go down the class register sp everyone got their turn. Jimbo, what is your surname so i can let mum know.